Whether participating in musical entertainment, attending a craft and nature club meeting, exercising or being spiritually uplifted at mass, residents can be spotted in Le Grand Room enjoying themselves. The openness of this elegant room provides our residents the opportunity to enjoy a wide variety of events and activities with their friends and families. Le Grand Room was designed with flexibility in mind. Our tables adjust easily for maximum comfort of all the participants. From large events like the Spring Fling or Senior Prom to small gatherings such as a family birthday, Le Grand Room is the perfect location. 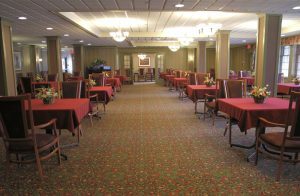 Lunch and dinner are served in Le Grand Room during the week to provide social opportunities for many of our residents. This restaurant style setting enhances the residents dining experience.